On March 2nd Attorney General Jeff Sessions recused himself from the crackpot “Russian” conspiracy investigations. He thought it would be a nice gesture to Democrats. It wasn’t. It was foolish. President Trump was furious with the Attorney General’s decision. Trump was reportedly blindsided by the decision and furious with Sessions at the time. In May Deputy Attorney General Rod Rosenstein named former FBI Director Robert Mueller as special counsel. This NEVER would have happened under Jeff Sessions. On June 6 Deep State activists reported that Trump was still upset with the Attorney General for his unintelligible decision. On June 8 former FBI Director and leaker James Comey admitted he played the DOJ into launching a Special Counsel investigation of the Trump-Russia connections. On Wednesday President Trump told The New York Times he never would have selected Sessions for Attorney General if he knew he would recuse himself from the Russian witch hunt. 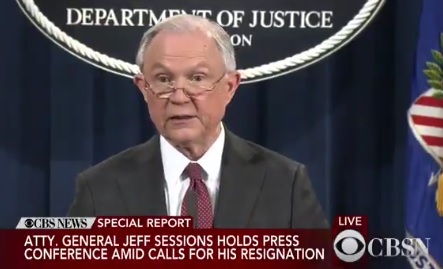 AG Sessions today said he is not planning on stepping down.